Hi there everyone! It’s been a while since I shared a home tour. I really wanted to share Anne’s and have her as part of my gallery and series. 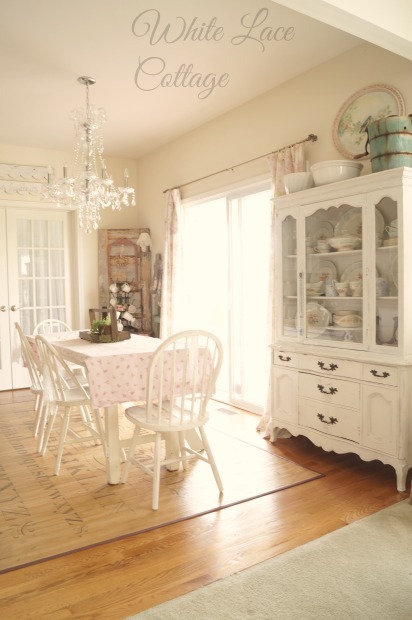 ENJOY her Shabby vintage farmhouse home tour. Welcome Anne from White Lace cottage. Thank you so much Debbie for inviting me to share my home . Your creative style amazes me,and your crafty side inspires me. People ask me what my style is and I always have a hard time answering that question. I have always had a love for vintage style,nothing perfect but always embracing the imperfect. 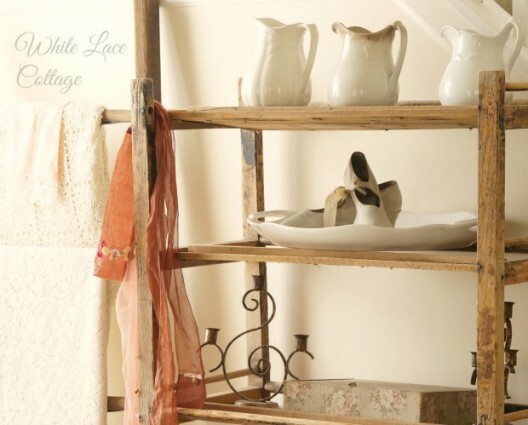 As much as I would love to live in an older home we don’t,so I fill our home with vintage treasures that I find. Sometimes pieces are transformed to look older than they are like those stools. I painted them with milk paint,the paint chipped off leaving them look as though they are old. But my favorite treasures are the pieces I find with original chippy paint. I do change things around often in my home as I find new treasures. That’s part of the fun of owning a shop,I can enjoy pieces I find then sell them. Sometimes I find things and even though I love them they go directly into the shop. These cabinets are maple and they had a dark cherry stain,a few years ago I painted them white,it was the best decision ever. It brings in so much light and the neutral color is a great back ground color which lets me add any color I want to. I collect many things one being vintage china,adding this cabinet to my kitchen was a must for my on going collection. But I do occasionally part with some of my pieces,as I run out of space. We spend most of our time in this area of our house,the kitchen,family room and off of our kitchen behind the French doors is our den. A recent addition to our kitchen is our chandeliers,If you know me you know how much I adore a little bling in our home. I added vintage charm to our family room,but like everyone else we have a large television, and a large entertainment center. Not sharing that in my photos because it’s not very pretty,but it is what it is. Eventually it’s something that will go but for now it works. Painting that piece won’t make it look any better. And sometimes you just have to work with what you have. Like my brown furniture,my taste changed a bit when we moved here 8 years ago. Hoping to change this out in the next year or so,but just for a bit of added color I added a few blankets to my sofa layering both for a pop of color. I did have a white slip cover on my sofa but it was not fitting right and it was a mess every time someone sat on it. 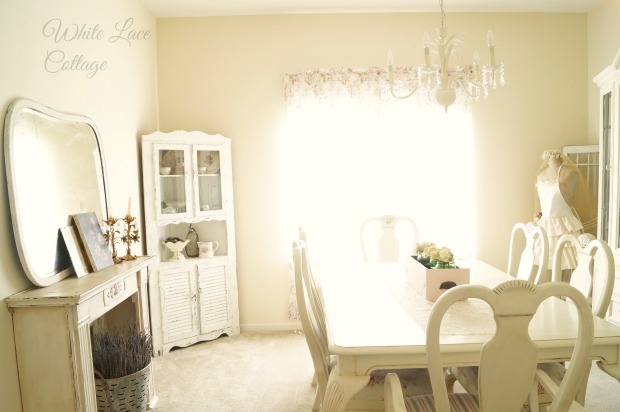 Recently I added a faux mantle to our dining room,you can read about the transformation; HERE. It is not a vintage piece,but one I painted to look vintage. My dining room table and chair set has been painted and distressed using a glaze,it’s a 1990’s set that needed an update. The hutch was also painted,actually I have painted it twice now this time painting it white. 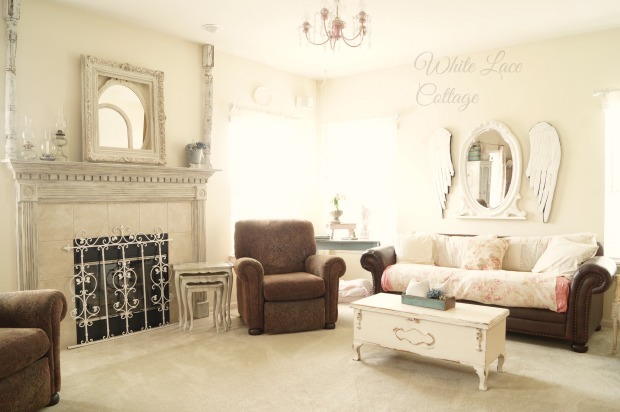 Yes my home has lots of white,it adds a beautiful glow to each room. 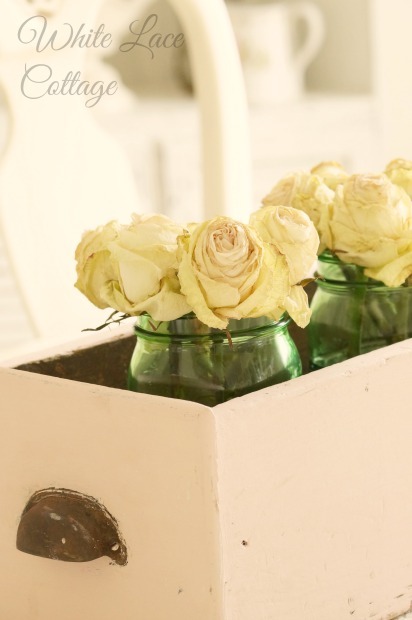 It’s easy to add a touch of any color to a room,but my choice is always soft pinks,blues or greens. I use fresh flowers in my home all year round. When I can’t bring them in from my garden I pick them up at the market,my favorite are always roses. And I keep them until the last petal falls. These are starting to go,but they still look pretty to me. One room we don’t use very often is our living room. But it’s the first room that guests see when they enter our home. It’s light and bright and airy. I recently added that vintage area rug just for a pop of color. Our 1980’s sofa has been updated with a slip cover,it works well in here as not many people ever sit on it. All the furniture in this room with the exception of our sofa was found at thrift shops and antique stores. Don’t be intimidated by antique stores,you can find great deals. 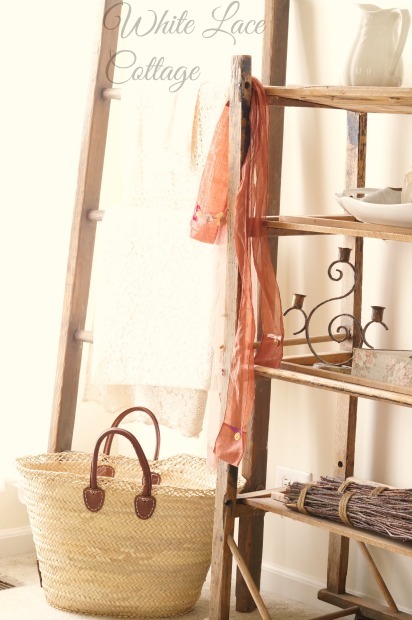 That wonderful old wood rack was 65.00 at an antique shop,not bad! That sweet french chair was 4.99 at a thrift shop,it’s in wonderful condition I just painted it. And just for fun I added that old metal dormer as wall art. Thank you so much for letting me share my home with you all,I hope you enjoyed the tour. 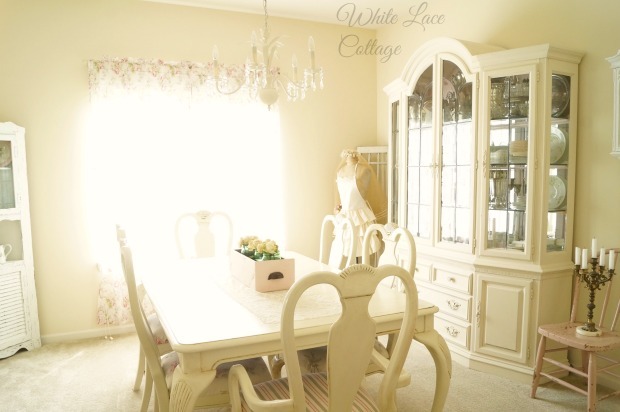 Please come on over for a visit at; White Lace Cottage and The Shop Of White Lace Cottage. Selling vintage treasures in my shop too. Love Anne’s home…she is one very talented lady!!! !…Great tour today Debbie!…have a great weekend Debbie and Anne!!! Very, very pretty! I love the look. Wish I could live there! Luv Anne’s home. Thanks Debbie for the tour. 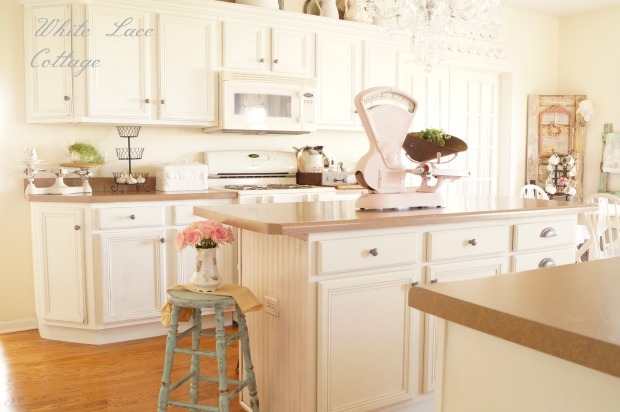 Thank you Anne for sharing your home I love your site and have enjoyed seeing your home! Thank you Debbie for featuring Annes Home! Beautiful! I would love to know the source for the rug under your kitchen table. So beautiful! Makes me ready to fluff my house a bit ! anne’s home is a fav of mine! it’s just gorgeous! Great tour Debbie! 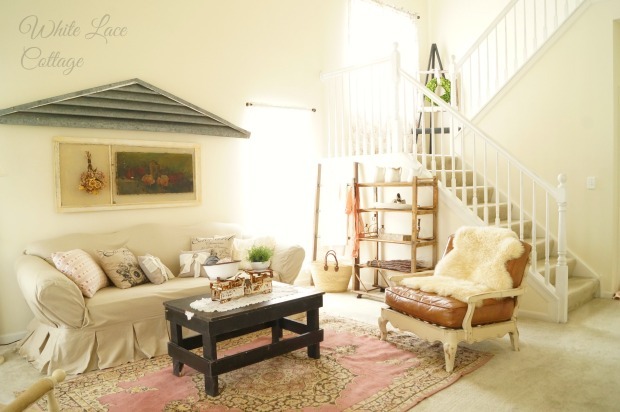 Love Anne’s home and style! 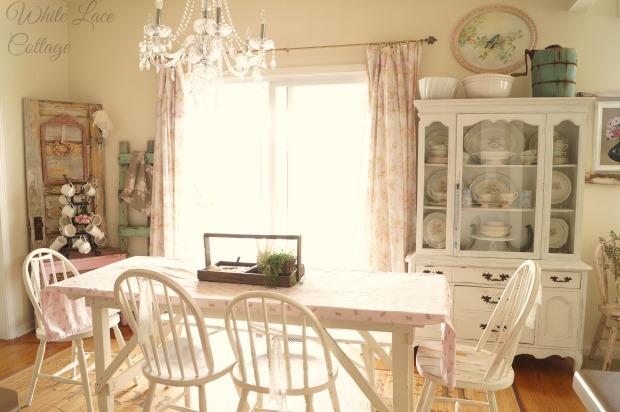 Anne has such a charming vintage style home…thanks Debbie for sharing it here. So pretty, bright and cheerful! 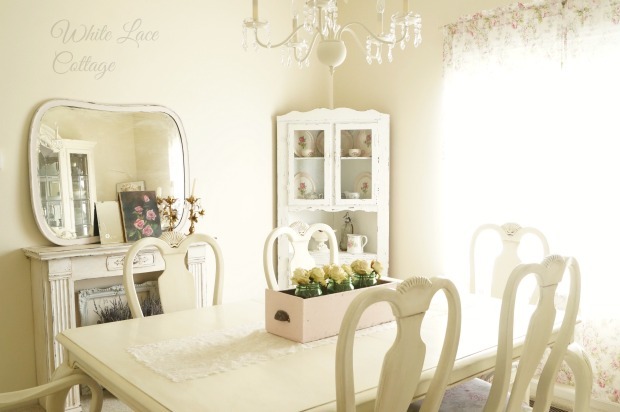 Ann’s dining room is so pretty! It makes me want to have a tea party in it! Happy Weekend! What a Lovely Home . You made it quite Welcoming. Such a lovely home tour! So sweet and inviting. Anne your home is beautiful. I really like the white (especially for summer). It looks so cool, yet comfy cozy. I especially like the sofa in your family room; I also cover mine with layers of soft country color. Your rooms are all very welcoming. Thank you for sharing.